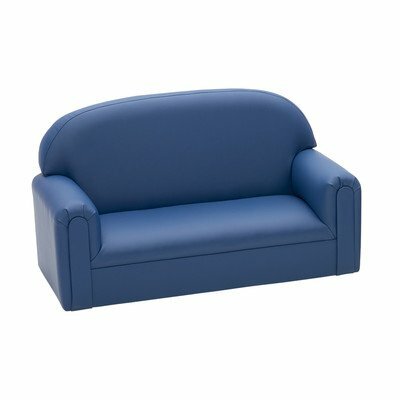 BNWCOG705 Size: Infant / Toddler (18 months - 36 months), Color: Deep Red Features: -Durable polyurethane upholstery. -Eco-friendly and healthier upholstery alternative. -Upholstery fabric is PVC-free. -Easy to clean with soap and water, alcohol-base solutions such as Fantastic or Formula 409, or mild bleach and water solution. -Hardwood frames and comfortable dense foam. -Meets all appropriate safety standards for children's furniture. Product Type: -Sofa. Frame Material: -Manufactured wood/Wood. Hardware Material: -Stainless steel. Country of Manufacture: -United States. Dimensions: Size Infant / Toddler (18 months - 36 months) - Overall Height - Top to Bottom: -19". Size Infant / Toddler (18 months - 36 months) - Overall Width - Side to Side: -34". Size Infant / Toddler (18 months - 36 months) - Overall Depth - Front to Back: -16". Size Infant / Toddler (18 months - 36 months) - Overall Product Weight: -27 lbs. Size Preschool (Ages 3-6) - Overall Height - Top to Bottom: -24". Size Preschool (Ages 3-6) - Overall Width - Side to Side: -38". Size Preschool (Ages 3-6) - Overall Depth - Front to Back: -18". Size Preschool (Ages 3-6) - Overall Product Weight: -34 lbs. Size School Age (Ages 6 & Up) - Overall Height - Top to Bottom: -28". Size School Age (Ages 6 & Up) - Overall Width - Side to Side: -45". Size School Age (Ages 6 & Up) - Overall Depth - Front to Back: -21". Size School Age (Ages 6 & Up) - Overall Product Weight: -42 lbs. Specifications: CPSIA or CPSC Compliant: -Yes. If you have any questions about this product by Brand New World, contact us by completing and submitting the form below. If you are looking for a specif part number, please include it with your message.